Almost one year ago now I finished reading “See What I Mean” (summary part 1, part 2), the book that got me started making comics. Now I’m reading the excellent “Drawing Words & Writing Pictures” and I’m learning much more about techniques and visual language. The first book I recommend if you are intrigued by the idea of making comics but always thought you couldn’t because you can’t draw, and also if you are intrigued by the idea of using comics at work (eg. see my comics explaining different use cases for my project RoboHydra). The second I recommend if you have some artistic background and/or after reading the first. I thought it would be fun to document the way I’m making comics now, hence this post. You start with an idea of what you want to tell, then divide it in pages. So far I’ve worked knowing the amount of pages beforehand, but I guess you could just fill pages until you’re done telling the story. The key here is that you have to think of pages because you need to know how they begin and end (eg. you don’t normally end a page in the middle of some action), and because the last page has to be full, you can’t finish halfway! Confirms that you can tell the story the way you thought. Gives you a way to check the rhythm of the story and see if it works. Lets you play with the shape and size of the panels (in this case I went with a pretty conservative grid; the only exception is the title). Sets the more or less final text in each panel. Gives you a way to decide the art for each panel (composition, perspective, etc) before you spend a lot of time making the final art. As this is the first time I worked with thumbnails, some things are not quite right: the text is sometimes quite different from the final version, some panels on the first page are quite different (I realised they didn’t work in the thumbnails and instead of reworking them I made the changes directly in the final version), and the art is completely different. This last bit is actually due to the fact that I originally planned to make this comic with stick figures, but after finishing the thumbnails I realised that I could draw better and decided to give it a go. When you’re happy with the thumbnails, you’ll have a pretty good idea of how the comic is, and the only step left is to make the final art. I use a Wacom Bamboo drawing tablet and I don’t have high standards for the final result (as you’ll see grin), but for people making “real” comics the process is a bit more involved, as they need to do pencils first, then ink. You can compare each page between the thumbnail and the final result, for fun, to see how much it has changed. However, remember that the difference between thumbnails and final comic should not be that big! The only reason why the thumbnails are stick figures and the final comic it better is that I realised too late that I could draw better than stick figures. In any case, I hope you enjoyed this post. As I said, if you’re interested in making comics but thought you couldn’t do it, go read “See What I Mean”. This is the second half of my summary of “See What I Mean”, by Kevin Cheng. It covers from chapter 6 until the end. See the first half on this blog. Composition of each panel (where characters go). See example on p.108. Tips: rule of thirds, writing speech bubbles first to use space better, avoid intersecting lines in foreground and background. Perspective (how the audience will look at the characters). Use and be aware of perspective and distance (where the camera is). 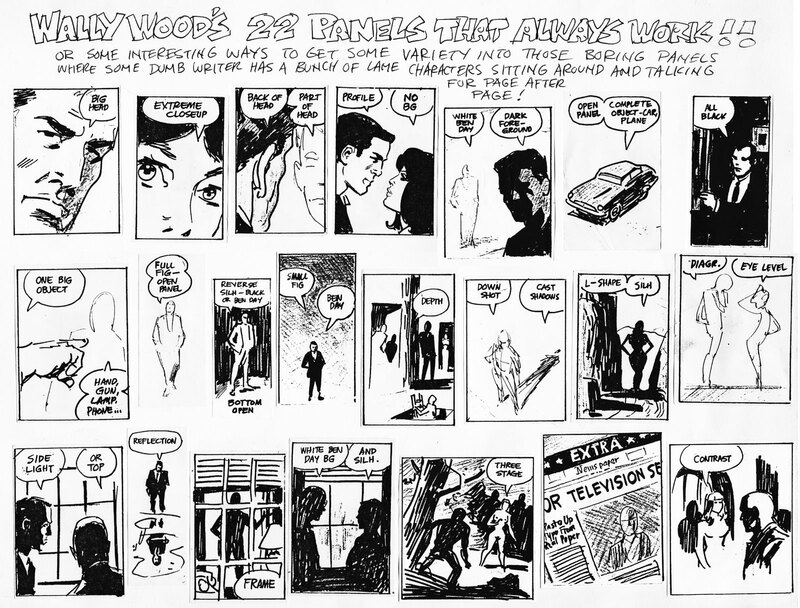 For inspiration, have a look at Wally Wood’s “22 panels that always work”. Flow & progression (change of locations, how time passes, …). What happens between panels should be obvious. Take care of small details like which hand is used, or the side of something. Reference materials: tracing over stuff is easy, quick and gives good results (eg. photographs, incl. made by yourself for the purpose, or avatar generators like IMVU or XBox). Templates: a couple available on the net, but tend to be limiting. Create your own templates? Comic creation software: several, seem too complex and/or expensive. Online creation tools: websites like bitstrips.com and pixton.com seem interesting. Requirements/vision: documents don’t get read, and if they do, they’re ambiguous. Comics are easy to read and explaining requirements through real use-cases often works better. Good start for projects/companies: comics help you validate your ideas before you build anything, or decide exactly what to build. In these cases, make the person read the comic on her own, then explain with her own words as she reads again. That way, misunderstandings are easier to spot. Also, make people say how it relates to them: if they or someone they know would use it. Marketing materials. Explaining your product, or why it’s special, through comics. It’s generally easier to get people to read comics than to read text descriptions of the same content. When convincing bosses to approve the use of comics, there’s usually less resistance than what people think. That said, understand who you’re convincing and what arguments to use (eg. some designers think that comics take relatively little time compared to alternatives, or the evidence suggesting that words + pictures help in understanding and memory). Fidelity and polish in comics (and any other medium) needs to be higher for certain audiences, eg. bosses or corporate clients. Oh, boy. It’s been a while, hasn’t it? This is the first post of the year, and it will be about the first book I’ve finished, “See What I Mean” by Kevin Cheng (which, by the way, I got from O’Reilly’s Blogger Review Program). It’s a book about using comics “for work”, to communicate ideas like product concepts, user stories, and such, more effectively. Communication: comics don’t need words, or can express a lot without them (p. 23). They’re universal! Imagination: characters with few features make more readers relate. This can be applied to UI mockups/sketches, too: people focus less on design if it’s abstract (p. 25,26). Expression: give interpretation to words (“I’m sorry”/”Thank you” examples with different facial expressions on p.27). When combining text and pictures, the sum is bigger than the parts. Time: comics can express time passing by using empty or repeated panels. Also, via words in “narration” and reference objects (like burning candles, clocks, or day/night). Drawing faces is easy! Eyebrows and mouth go a long way to express mood. Body language helps quite a bit, too, and it’s easy to represent. See examples of combinations of eyebrows and mouths on p.47, 48. In faces, eyes go in the middle, and dividing the bottom half in three gives bottom of nose and mouth. Also see http://www.howtodrawit.com for tips on how to draw different things. Approx. proportions for a person are two heads for torso, 1 for hips/groin, and 3 for the legs. Body language basic guidelines: leaning forward shows interest, concentration or anger (depends on arm position and context; curling the spine works, too); arm position can tell a lot (lifting one or both, on chin, in front of body); head positions don’t change much, but facial expressions or where the person is looking, does. When drawing body language, try to imagine the situation and exaggerate it. It often helps to start with a stick figure, then add detail. What’s your comic about? Why you’re using comics, what to include, who’s the product and comic for. This chapter is about this step. Writing the story: create scripts in words, an outline, define characters, setting and dialogue. Laying out the comic: plan each panel, what to show and how much of it. Don’t approach the question broadly and vaguely, break it down! Define goals (what to accomplish), length (3-8 panels encouraged; should fit on site homepage, a postcard or e-mail; if longer, consider physical prints), audience (expertise level, context), and representative use case (help your readers understand why they should care). Setting (defined up front, usually in bold). It can be time of day, location, or maybe what happens in the background. It depends heavily on the audience. The first panel can help with the setting (“establishing shot”). There are different graphical ways to convey a setting: the description of it describes a concrete way (eg. exterior of coffee shop vs. interior of coffee shop vs. close-up of coffee cup being served). Characters (all caps, bold). There are several types: target audience, people who interfact with them, and objects/locations that play a significant role (eg. the solution). Target audience is typically based on personas, go make them if you don’t have them already. Dialogue (regular font). It’s defined by more than the text itself: fonts, sizes, colours, bubble shapes or the split into different bubbles are very important, too! The text can be hard to get right: make it fit the character, keep it realistic (avoid marketing jargon and overly enthusiastic conversation). Captions can communicate time, setting, action, and even dialogue, but don’t add unnecessary information in them, and always try to speak from the character’s voice. Actions (usually italics). It’s what characters do, depicted in the panel art. How to tell a story: remove all unnecessary. You can combine several points in a single panel. Show, don’t tell. See examples on p.98-100. And that’s it for today. In a few days I’ll publish the rest of the summary. Some time ago (probably a couple of years) I learned about a couple of TMNT issues that I wanted to read. Yes, that means “Teenage Mutant Ninja Turtles”. I never thought I would want to read a TMNT comic, let alone paying for it, but there you go. The reason why I wanted to read those issues were some amazing drawings by a very talented artist. Also, that apparently the story was much more “mature”. Presumably it just got the idea of four turtle-like creatures (anthropomorphising them in a somewhat natural way, a bit like Blacksad), and he added some amazing art to support the story. The problem was, I had forgotten about the title of the comic and the artist name… and I didn’t have the bookmark (if I had had Opera Link at the time, that would not have happened; but I digress). So, a couple of weeks ago I got really obsessed with it, and I decided to look for it again. After a couple of hours to fruitless search, I finally found it. It was Soul’s Winter, by the incredible Michael Zulli (official page, Wikipedia), also author of “Delicate Creatures”, The Puma Blues and some work on The Sandman. Have a look at the art in the issues themselves.